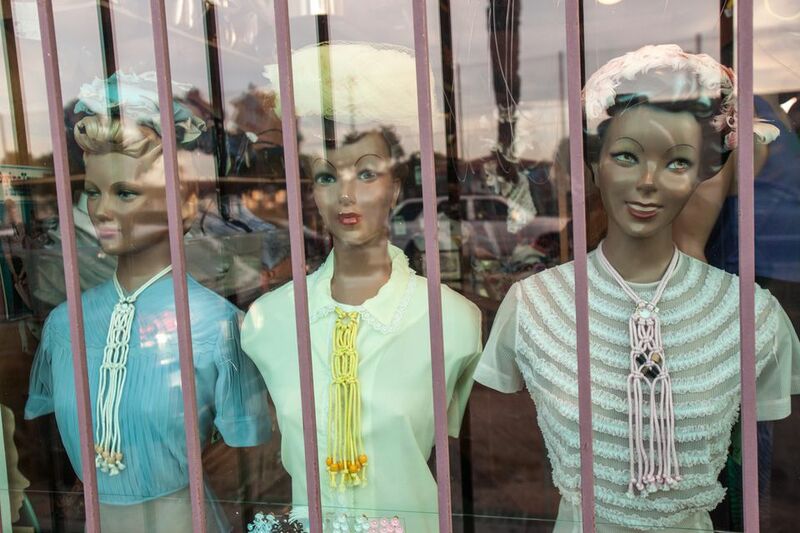 You'll find tons of vintage clothing and furnishings on funky East 4th Street in Long Beach, California. Our guide to Retro Row will help you spend your time (and money) as you pop in the vintage shops in search of clothing, jewelry, and home decor items. Most of the shops don't open until noon, and they don't stay open very late, but that doesn't stop Hollywood costumers and set designers from browsing the strip of East 4th Street in Long Beach between Junipero and Cherry Avenues looking for the perfect period pieces for movies and TV shows covering the 20s to the 80s. This long block is home to over a dozen vintage clothing, furniture, and collectibles shops with a few charity thrift shops and stores selling complementary new items thrown in for good measure. This visual tour of what you can expect from a shopping excursion on 4th Street will help you get ready for a fun outing. You can either begin your 4th Street scavenger hunt by fortifying yourself with a cup of "joe" at Portfolio Coffeehouse or start at the far end and stop for a pastry and a drink when you're through. The decaf is more bitter than some like, so consider choosing tea or an Odwalla fruit juice, but the salads, sandwiches, and pastries are great. Portfolio exhibits the work of local artists. They also host a Sunday morning story hour for kids, an open mic night on Wednesday nights, and have other live entertainment on some nights. Songbird offers a selection of offbeat and unique gifts, retro clothing and vintage dresses, cool handmade jewelry, and both retro and funky modern home decor. It's a great place to shop for gifts. In business for nearly two decades, Xcape specializes in vintage mid-century modern furniture, patio furniture, and home accessories. You'll also find Heywood Wakefield and Rattan furnishings and accessories. They are open on weekends and Monday - Thursday by appointment. Sneaky Tiki is a great little shop for vintage clothing and accessories, Hawaiian shirts, cowboy boots, and jewelry. Tattoo memorabilia makes an unusual souvenir. They support local artists and have one of a kind decor and art. This retro boutique has lots of fun clothes from the 30s to the 80s. They are known for the "Pile Sale" they have on the 3rd weekend of every month, where you can dig through a giant pile of clothes looking for bargains from 99 cents to $5. Accent Pieces is one of the few shops on the block carrying only new merchandise, home accessories and gifts from lamps and candles to kitchen characters and garden decor. Favorites are the Japanese lanterns and the chalkboard animals designed by Mandy Del Rosario. Meow specializes in "dead stock"—unsold merchandise from the 1940s to the 80s in new condition. The store attracts retro enthusiasts as well as film and television costumers, fashion stylists, and designers. Just like the name says, East 4th Skateboard Shop has everything for the avid skateboarder, including repairs. They have been in business at this location since 1996. Their goal is to totally outfit the surfer and skater with quality products. Open daily 11 a.m. - 6:30 p.m. Founded in 2008 by two Long Beach natives, Lil Devils specializes in children's clothing, toys, and accessories that are either retro, retro-inspired or unique and fit in with the vibe of the neighborhood. Open daily, Lil Devils has unique clothing, baby gear, and toys for kids 0 - 6 years of age. They have unique greeting cards and edgy gifts. Retro and newer used clothing, home decor, and gift items. Runway Trash Boutique describes themselves as "a fashion collaboration of the past, present, and everything else in between." By now, you may be hungry. Number Nine Noodles is a Vietnamese restaurant featuring noodles and beer—simple, healthy, and enjoyable dining. They make dishes with fresh, local ingredients. Add in their selection of unique wines and craft beers and you have a great little restaurant for a relaxing lunch or dinner. Still in relaxation mode? Art du Vin Wine Bar combines art deco style with the feel of a neighborhood pub. Sip wine on the patio after shopping or checking out a movie at the Art Theatre next door. If you present a receipt from a 4th Street business you can get a 10 percent discount.